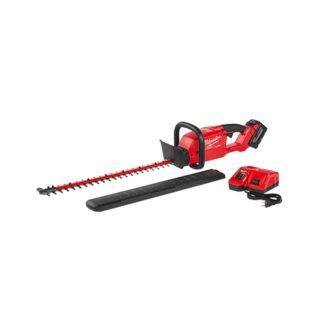 Milwaukeee 2726-21HD Hedge Trimmer Kit with 9.0 Ah Battery and Rapid Charger. Awesome tool. Works great. Trimmed both hedges, that really needed trimming, and lots of battery remaining. Cuts like a dream. Highly recommend this product. Lots of power. Used it to trim quite a few bushes and the battery still had 4 bars! Nice long blade, but the unit is a bit heavy if you have to reach with one hand. A must to have for trimming!